Happy Friday! I hope that you have had a wonderful week! So far this week has been great. I got all my workouts in, I've been eating really healthy and launched our #SpringFeverFitness giveaway. Today I need to get my run in, and get ready for another class I am teaching tonight at a friends home. We have a fun dinner planned with friends tomorrow night, one of our close friends is in from Florida so we will be spending time with him as well. It is also so great to have some great weather so we can get outside and enjoy the sun! That always puts me in a good mood! What are your plans for the weekend? Lately I have been reading and hearing a lot about finding your why. This is not a new concept for me and I often say that I have found my why, but I think as I get older, and hopefully wiser, that my why has changed. I have changed and so have my health and fitness goals. I am a mom of a very active toddler, and I would like to have another baby at some point. When I was younger my goal was always to be skinny. If you have been reading my blog for a while then you know my story. If you are a new reader (Welcome!) and you can read more about me and my story here. I was always trying to find what the new quick way to lose weight would be and then going full force until I wore myself out. I have changed that mindset to more of just living a healthy lifestyle and setting a good example for my daughter. I don't want her to grow up having the same body image issues that I did. I want her to learn what strong and healthy is. I have seen a change in that direction in the fitness community that I am a part of and I can only hope that it continues on that way. My biggest why is my daughter. I want her to have a mom that is her example of health. I want to be around and active as she grows up. I want her to know that healthy eating means lots of fruits, veggies, lean protein, but also that it is okay to have a cookie or some ice cream and that's totally okay. The only "junk food" we talk about is fast food, and that for us is a never food. Other than that she knows its okay to have a cookie after we eat our healthy dinner. I don't want her to have a complex about food, I want her to just grow up with a good base of what healthy eating looks like. She has seen me workout or be active from the time she was just a baby. We started with daily walks, well she was in her stroller, and she would sit in her little bouncy seat in my gym when I worked out. As she has gotten older she is now starting to join in my workouts. She knows that it is just a part of what we do. We go for walks, we do yoga together, she joins in when I am doing planks or jumping jacks. It is just a part of life. I never talk about weight around her, and don't use negative talk about my body. I love my body, it gave me my daughter, and for that I will forever be thankful! I don't worry so much about my weight, I just want to be able to run, jump, crawl and play with her. That is what life it about. It's not saying that I don't have my own fitness goals, just that they don't control my life like they once did. I just want to live happy. healthy and balanced. That for me is my why, and I remind myself of that daily. When I started blogging it was just a fun hobby, and I love to write. For me it was a personal journal. As I have continued on with it, my hope is that I am able to help others find their love for fitness and healthy living. I try to set an example and inspire others to workout and eat right because they love themselves. I enjoy blogging and connecting with other ladies in the fitness community. I also want to build a brand for myself and have my own business. It is important for me to have my own identity and work (outside of being a mommy), and grow as a business professional. 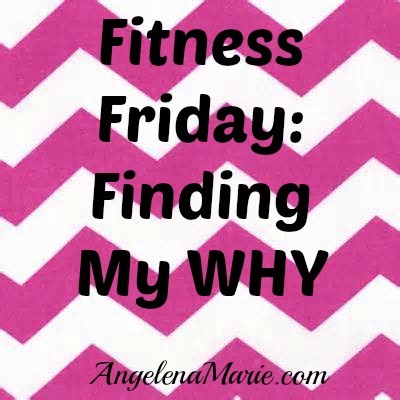 My why comes from the need to create something and share my love of healthy living with others. I am an entrepreneur at heart, I went to business school, and I know that one day I will be running my own business, whatever that may be. I think that really delving into what makes you do what you do is so important. Defining your why will make it that much easier on the days that you are tired or lacking the motivation to get going. I encourage you to take the time to figure out your why and write it down. Put it where you can see it everyday. Let's chat! What is your Why? Do you have more than one Why? What keeps you motivated on a daily basis? I would love to hear from you! Thanks for stopping by, I really appreciate having you visit my little piece of the internet! Don't forget to enter the #SpringFeverFitness Giveaway, there is a HUGE prize pack! Today I am linking up with Nicole from Fitful Focus, Jenn from Pretty Little Grub, Katie from Running for Cupcakes, and Clare from Fitting It All In. Head over and check these ladies out!